It is our hope that all of us together can be partners with God in bringing this about so that our communities may be signs of this life and fill people with hope for the future. 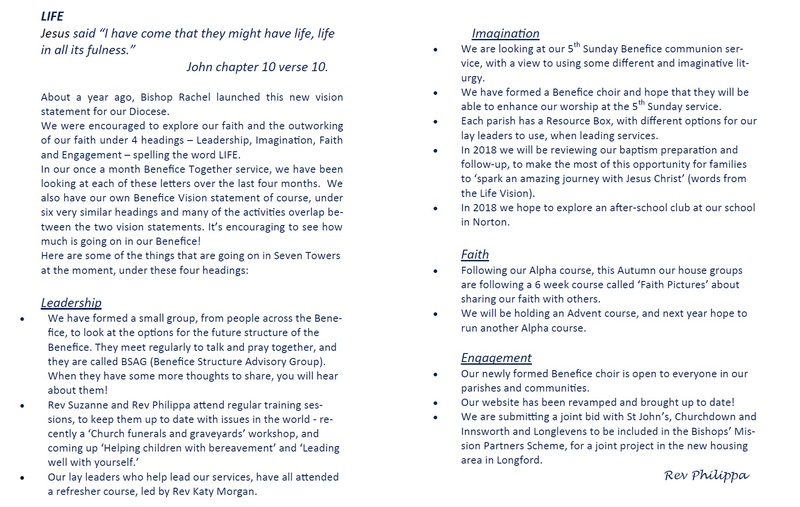 To help give us a focus and a plan, in 2015/16 we worked together to develop a vision for our benefice. As people have come forward to offer their talents and time, in 2017 we started to live our vision out and to put our hopes and dreams we have for our communities into practice. Our hope and prayer is that we can grasp the moment to re-imagine ‘Church’ in our own context and in the wider contexts of the benefice, Diocese and the world. Our vision has six separate strands – Expressing our faith in worship, Belonging and sharing, Developing our Christian faith and the Christian faith of others, Welcoming and encouraging children and young people, Learning and developing and Connecting to the kingdom. Click on the logos above to find out more about our vision strands. Our hope is that our whole benefice family will be motivated by the vision and our aim is to see every church member play their own part in developing the life of our benefice. We all have God-given gifts and talents. Working together and sharing them, and living generously, brings joy, fellowship and understanding of our needs and those of others. If you would like to find out more about the vision or to offer your gifts and talents to support our vision values, then please don’t hesitate to get in touch with any of the clergy, churchwardens or the benefice office. Read about how we are responding to the Diocese ‘LIFE’ Vision.